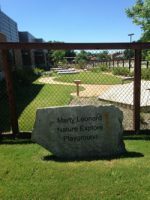 The Marty Leonard Nature Explore Playground at the Lena Pope Early Learning Center is located in the heart of Fort Worth on our brand new campus at 3200 Sanguinet. We opened the doors to our Early Learning Center in September of 2014 where we serve ages six week to five year olds. We opened the Marty Leonard Nature Explore Playground to our children in October and it is one of the largest Nature Explore Playground in the Country! 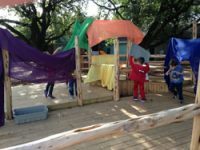 The Nature Explore Playground at Lena Pope is truly utilized as an extension of our indoor classroom and was designed in a way to promote learning through the use of our outdoor centers. 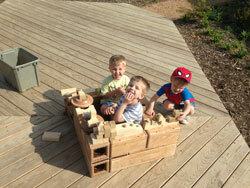 Essentially, any learning that could take place inside can also take place in our outdoor learning classroom. 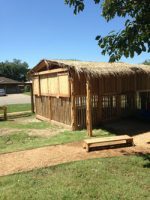 The children are encouraged to use their imaginations and exploration skills while learning in a garden-like setting, complete with native plants, natural materials, and products that will stand the test of time and grow with the outdoor classroom. Beautiful flowering plants were selected for their aesthetic qualities as well as their resistance to drought in our Texas heat. They line the fence are and climb skyward to cover the fencing, which is a natural color, selected to blend into the landscape and match the building. Wooden signposts with named areas are burned into the wood for a more natural look and larger areas are designated with etched stones. 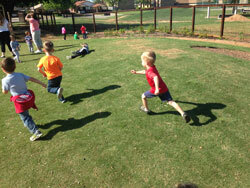 Low plant life exists throughout the outdoor classroom in order to increase visibility. 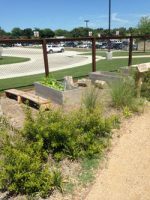 These shrubs and grasses provide purposeful design elements that also designate the separation of space between outdoor learning areas. Our exceptional donors have really made this outdoor classroom a possibility and are even honored with namesakes throughout the playground. 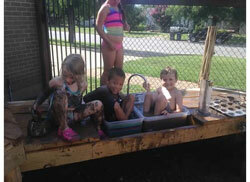 Niederer Woods, Meta’s Meadows, and Shirley’s Garden offer beautiful playscapes where the children can take advantage of the space while developing their larger motor skills. Other favorite areas include the Mud Kitchen, Climbing and Crawling Area, and Sand Hut, all designed and built by our on-site director of properties and his team. Our beautiful outdoor classroom truly serves our children with a natural play experience that does not exist on just your average playground. We are so proud to be able to learn in such a unique and well-designed space, made possible by so many wonderful people in our Lena Pope Family.